What do you remember about those days? Climbing the stairs to the second floor of the Odd Fellows Hall where the branch met for about 20 years? Attending meetings in the Seventh Day Adventist church on Plum Street? Holding missionary farewells at Lincoln Elementary School or Allen School? Maybe something you read here will spark a memory. If so, please share it. Maybe you know of former members who haven’t discovered the blog yet. If so, please send them a link. I’m hoping we can examine the Aurora Branch experience from many angles, both fun and serious. On one level we can remember the remarkable people and all they did to hold the branch together. On another level we can see what the Church was like in the 1950s, for example, when we were trying to change the world’s perceptions of Mormonism as a backwater religion. Of course, in those days the tiny branch in Aurora, Illinois, was second-class even among other Mormons, especially those who came out from Chicago to speak and those who moved there briefly from Utah. After all, Aurora was the mission field and not the heart of Zion. But the Aurora Branch was never second-class in the character and caliber of its members, nor in the eyes of the Lord who looks, we’re told, with special favor on small things, foreseeing their promised greatness. Let’s pool our memories. For a start, here’s a photo from the early 1930s. The irrepressible branch president, James T. Greer–-soon to be one of the central characters of this blog–-steals the scene by reaching behind the missionary next to him and tugging on his ear. So much for a formal portrait of the early branch. 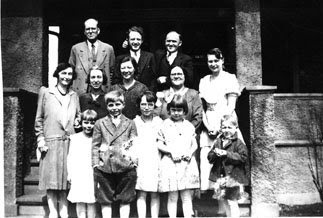 The members are (back row) Arch McCraney, Elder Gittins, James T. Greer; (middle row) Cora Hall, Mable Stemple, Myrtle Greer, Myrtle McCraney, Catherine Minnehan; (front) two neighborhood children Myrtle Greer brought to church—possibly surnamed Merideth, Louise Greer, Helen Marie McCraney, Jimmy Greer. They’re standing on the front porch of a big old house on Main Street, one of several places where the branch met before settling into the Odd Fellows Hall. This is probably 1932 or 1933. Not quite ten years later Brother Greer, who loved people, was still mixing things up, probably teasing Nancy McCarty about a boyfriend. 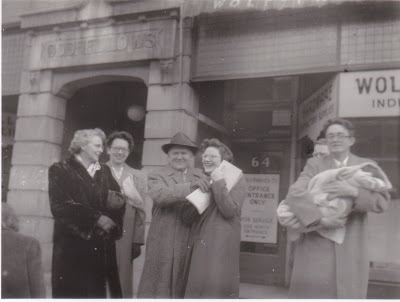 This snapshot was taken after church in front of the Odd Fellows Hall (door on left). Left to right: Ardis McCarty, Louise Greer, James T. Greer, Nancy McCarty, Jimmy Greer (hidden), Kent McCarty holding baby. So who are all these people and what are their stories? Stay tuned. This looks really good. I love the pictures. I wish I had a memory to add. I think it would be fun to add a picture in the beginning too. I am really excited about the blog. Thanks, Cathy. I appreciate your comments because you are a veteran blogger. I'm curious about how much these stories and photos will appeal to new generations who did not experience the Aurora Branch. Joan, welcome! Thanks for signing on and sharing. The Seventh Day Adventist church on Plum Street that we rented had several steps up to the front door. Is that where you fell? That must have caused a stir. I hope you weren't hurt. Do you have any photos of the pioneer parades? I have some of parades at Phillips Park. Welcome aboard. We would love to see your photos and hear those stories. You can send them to my email address for posting if you like. Br. Bob Ross asked for your mom's address the other day. Maybe you'll be hearing from him. I think it's great to renew old contacts. Most interestin history. Lot of work to put this together. I have a building on La Salle across the street from the Odd Fellows Hall. A group of property and business owners on La Salle are putting on a Classic Car show tomorrow, October 4th, 2009 in th street on that block.